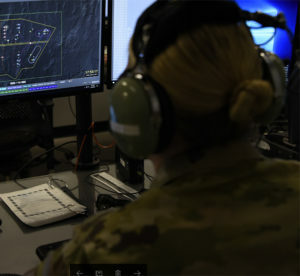 Airman Eden Martin, 607th Air Control Squadron weapons simulation technician, watches a monitor during the first all-female Command and Control Battle Management Operations team mission March 22, 2019, at Luke Air Force Base, Ariz. 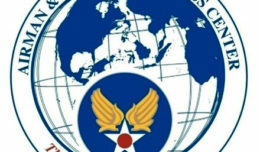 The team uses intelligence such as types of aircraft anticipated, how many air bases are in the area and political borders to plan a “war” from beginning to end. 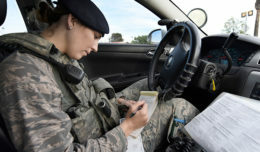 From scheduling and mission planning to communications equipment set up and maintenance, a full crew of women from the 607th Air Control Squadron at Luke Air Force Base, Ariz., left their mark on history. The 607th ACS is a schoolhouse tasked with developing the future of command and control, one Airman at a time. They are responsible for seven different courses ranging from the initial Surveillance Technician course for recent graduates of their preliminary technical training to the Undergraduate Weapons Director course, teaching Airman aerial engagement and combat weapon system employment and management tactics. Normally, at any given time, there are nearly 80 Airmen in training at the 607th ACS. 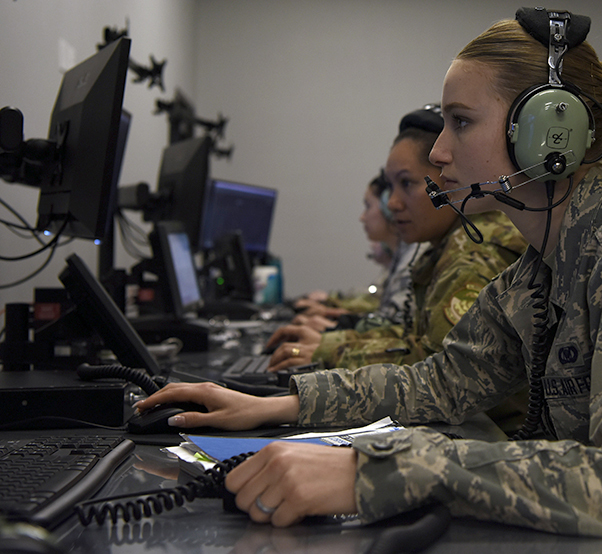 “We teach our students how to interpret radar data and make sure that we are controlling the battle and keeping our pilots as safe as possible in what are usually the busiest air spaces in the world when we deploy,” said Master Sgt. Summer Chenault, 607th Air Control Squadron Alpha Flight Chief. Mission planning is an all-day event and starts the day before the mission. The team uses intelligence gathered to plan a war-time battle management scenario from beginning to end. They look at types of friendly and enemy aircraft anticipated, how many air bases are in the area, political borders and what they can expect from each crew member. Master Sgt. Summer Chenault, 607th Air Control Squadron alpha flight chief, manages the all-female Sensor Operations Team during a defensive counter air mission March 22, 2019, at Luke Air Force Base, Ariz. The 607th ACS is a schoolhouse offering seven different courses ranging from the initial surveillance technician course for recent graduates of their preliminary technical training to undergraduate courses offering college credit upon completion of the class. “It is very detailed because if you don’t understand what you’re doing when you step out there, then you’re not going to understand what you should be doing while you’re performing the mission,” Chenault said. With 18 members involved in the mission in some way and in an operations environment that has traditionally been male dominated, the opportunity to conduct a mission with this type of crew had never presented itself on this weapon system. Although the mission itself was conducted by an entirely female crew, the excitement was felt throughout the 607th ACS. Whether it’s carrying out an all-female mission or any daily mission, the instructor cadre aims to inspire and takes pride in sending the best trained Command and Control Battle Managers out into the combat Air Forces.